Feral Support | Borderlands FAQs | Why did my character disappear when I updated Borderlands to version 1.0.3 in the App Store? Why did my character disappear when I updated Borderlands to version 1.0.3 in the App Store? If you purchased version 1.0.2 of Borderlands from the Mac App Store (between August 3rd and August 8th 2012), you will have lost access to the save games that stored your character data if you since updated your game to version 1.0.3. This is because version 1.0.2 of Borderlands contained an error which meant that save games were created in and loaded from a different location to the previous version (1.0.1) of Borderlands. The error was corrected in version 1.0.3, but players who bought version 1.0.2 and played the game for the first time before updating their copy to 1.0.3 will no longer have access to the character they created in that time. 1) First, start the Borderlands application and select the Advanced tab. 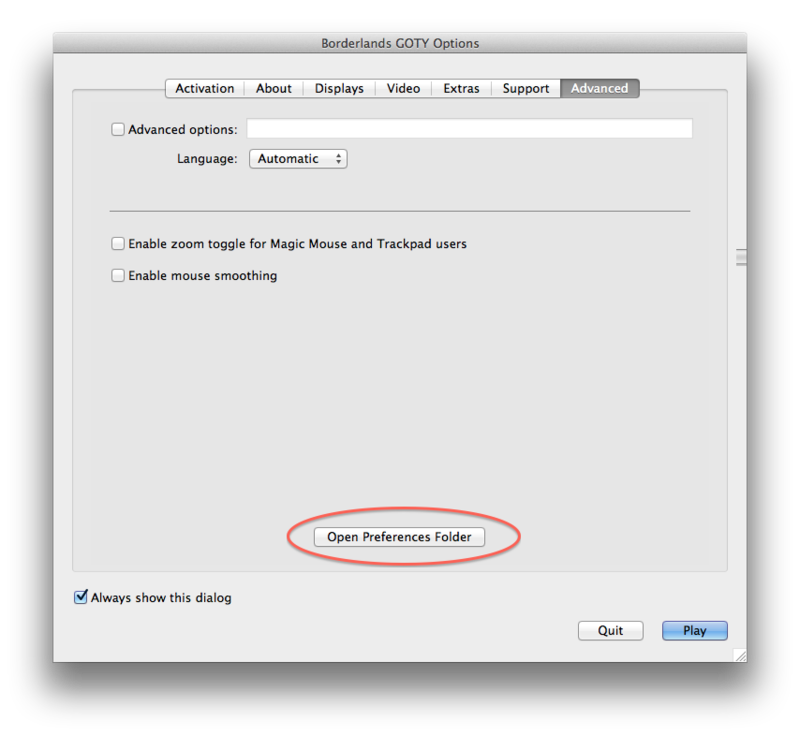 Click the Open Preferences Folder button. 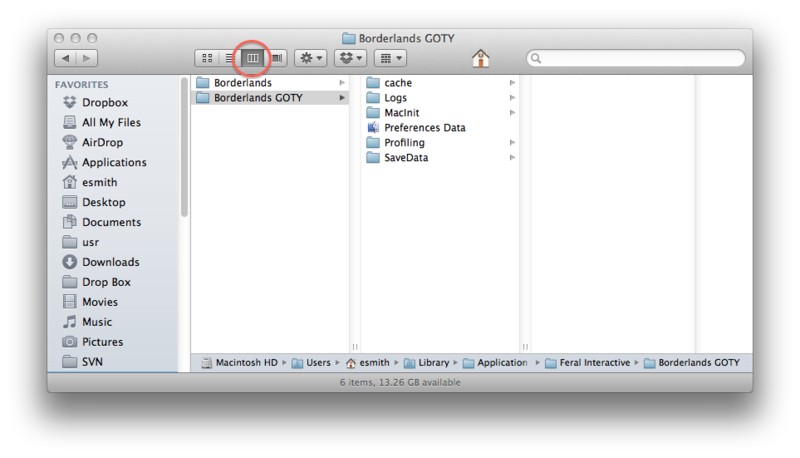 2) A new Finder window will appear showing the contents of the Borderlands GOTY folder. If your Finder is not set to column mode already, make sure you set it to column mode before you continue with these instructions. 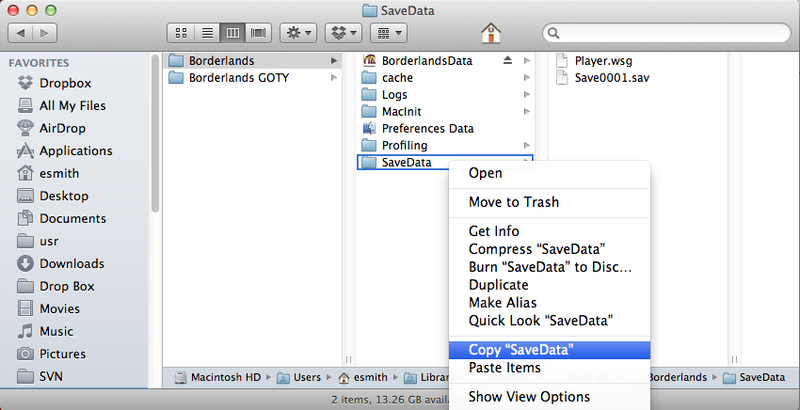 3) Right-click or Ctrl + click on the SaveData folder (which contains your save games), then select Get Info. Rename it to "SaveData(old)". Renaming this folder means that if anything goes wrong, you will not accidentally delete a save game. 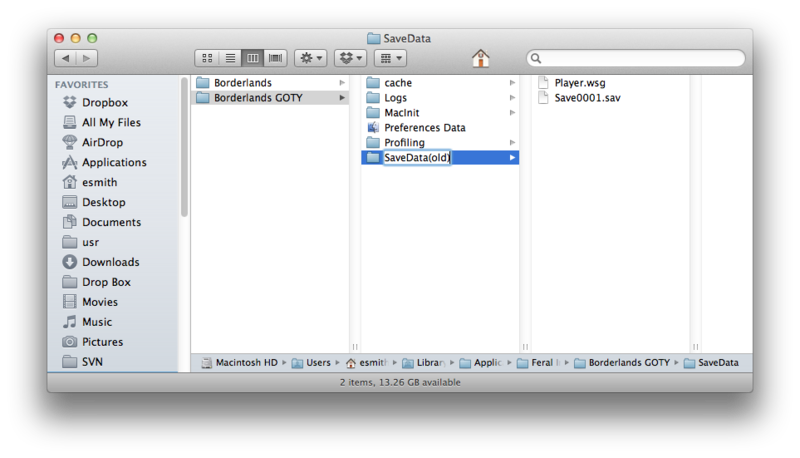 4) Once you have renamed the folder, click on the Borderlands folder and select the SaveData folder. Right-click or Ctrl + click on this folder, then select Copy "SaveData". 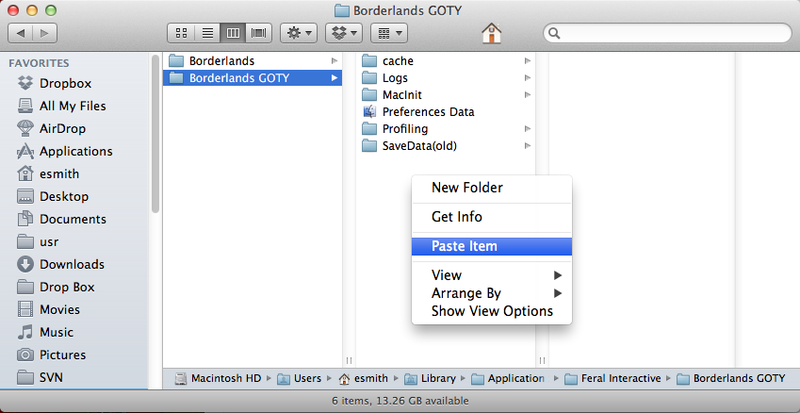 5) Click on the Borderlands GOTY folder, right click or Ctrl + click within the folder and select Paste Item. A copy of the SaveData folder from within the Borderlands folder will appear in your Borderlands GOTY folder. 6) Your Borderlands GOTY folder should now look similar to this screenshot. The next time you load the game, your character(s) will appear as expected. Once again, Feral would like to apologise for any inconvenience caused by this issue. If you have any trouble following these instructions please don't hesitate to contact us via email and we can take you through the steps in detail.